so WHY is that "project" still sitting there? 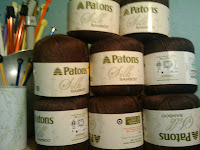 all the skeins of yarn are stacked nice and neat, there's a sticky note to mark the page of the t-shirt style pattern that is just waiting in my new book .... i've even swatched so i know that i prefer my knitpick needles over my bamboo ones .... and yet ..... it's all still sitting there ..... because why? Time: yep! committing to a garment is going to require Time and .... PLANNING ... yep! another one of my "strong" points! and did i mention COUNTING? yep! i'll have to actually keep track of where i am in the pattern, making notes as i go so that the right side will Match the left side [what a novel thought!] Now, while all these are valid excuses and perhaps even signs of wisdom, i also recognize them as signs of "immaturity" ... and basically FEAR! and the best way to overcome Fear is just to plow right through it rather than allow that foothold to creep into my knitting stash! There is no fear in love; for perfect love casts out ALL fear! (I John 4:18) Now i realize that this is just a bit (LOT) out of context, but in some ways it's really not! I LOVE to knit ... and allowing anything to sidetrack shouldn't even be welcomed in my thought process .... i'm growing each and every day as a knitter by learning something, even if that means doing it wrong and ripping it out ... it's still a lesson that builds, day after day, on what I ALREADY KNOW! and isn't that just like my Faith in the Lord? !!! yes and YES and YES! Every day He gives me 1,440 stitches/minutes to knit with. Every day! and as of today, i'm looking at approximately 26, 691,861 stitches TOTAL ... and that's a LOT of skeins of time with which to knit! Even more so, i have all the instructions i need for life, and love and living a Godly life contained within His Master Pattern - my Bible. ALL the instructions .... no gaps or misprints or mistakes in sizing .... so why do i leave so much on the shelf just staring at me, untouched, unknit ... not even swatched? Looking back should, and does, remind me of His Faithfulness ... His Mercies are New each morning .... His forgiveness is so sincere that He has removed my sins as far as the east is from the west (ps. 103:12). These are not hopeful wishes, but clearly documented PROMISES ... so that i can ... and SHOULD. ... jump back into the knitting of TODAY, receiving the gift of His construction and design, and by Faith submit to becoming the fabric that He is knitting .. and labeling as mine! Note: Upon completion, this yarn will be impervious to flames! Redemption has fortified this yarn, and left it White as Snow!